Thanks Bro! I wanted to see this. 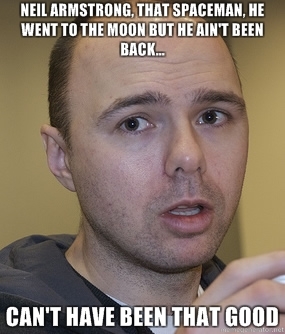 Incidentally, I don't need to educate any of the lot of you on the madness and hilarity that is Karl Pilkington, do I? I completely obsessed with him. His idiotic ramblings are the stuff of legend. I've put up the first three episodes of Season 1 of the Ricky Gervais show. I recommend it. I've put two of the episodes of An Idiot Abroad as well as all of Season1 of The Ricky Gervais Show up on my site. Grab them...again I'm totally obsessed with him. There are minor pieces of his thoughts on each episode on An Idiot Abroad, where I happen to completely agree with him. Do you find yourself doing that or not at all? smash wrote: There are minor pieces of his thoughts on each episode on An Idiot Abroad, where I happen to completely agree with him. Do you find yourself doing that or not at all? I've only seen China and India thus far, but I do catch myself nodding in agreement with some of his observations (especially about food...wtf scorpionkabobs). the balut definitely agreed with. And when you see this last weekend where he was in Jordan (Petra) the 'stew' (if you can call it that) that locals make him.... oh god. But the wailing wall in Israel, the fences around holy places in Israel; I completely agreed with Karl's viewpoints on. AN IDIOT ABROAD 2: THE BUCKET LIST again finds Pilkington sent out on a forced quest. This time, Gervais and Merchant send their reluctant friend around the world to sample adventures that “you must experience before you die.” The only problem is that the trip might kill him.